One of Black & Decker’s more affordable options is the CHV9610 Dustbuster 9.6-Volt Cordless Hand Vac. It looks modern and sleek, and is actually kind of pretty, but is the money you save in buying it worth a possible cut in performance? Or has Black & Decker managed to create an inexpensive but effective vacuum? At first glance, 9.6 volts is…not an ideal number. Now, you can’t expect too much from a handheld vacuum in terms of power, because they’re simply limited by their smaller size. Hopefully this Dustbuster’s design makes the most of the power it does have, at least. And it does, in spades! The CHV9610 is surprisingly strong for only having 9.6 volts. I mean, it’s still not going to match up to say, a larger stick vacuum, but for a handheld it really gets the job done fairly well for small messes. Some handhelds have suction mouths as wide as the entire vacuum (try fitting that into a smaller space) and some have little narrow mouths to try to make the most out of their suction (try cleaning up spread out debris with only one swipe with those). This vacuum is right in the middle and manages to get some of the advantage of both sides. Its handle is also nicely placed so you don’t have to contort your wrist to put the mouth at the right angle for suction. Black & Decker seems to be doing that thing where they never explicitly say what kind of battery they’ve chosen, but going by its charging time, it’s probably a NiCad. Its charger is Energy-Star rated and has an indicator light, but remember that for this vacuum, the included wall mount is not the charger – it still needs to be plugged in after you’ve hung it up. In any case, one advantage of the Dustbuster’s relatively low power is that it’s not too much of a draw on its battery, giving it a pretty good runtime. This vacuum is only one pound – that’s just about the lightest handheld I’ve encountered. Between that and its ergonomically angled handle, it barely feels like you’re carrying anything. As you might expect with a very inexpensive vacuum, the Dustbuster comes with a pretty standard papery filter. It works well enough for what it is, and is at least easy to replace. Here’s what gives this vacuum its aesthetically pleasant appearance, with translucent pink or teal options. But that’s not all! It’s 31.8 ounces – that’s downright huge for a handheld vacuum. It is admittedly hard to take off and clean, but it’s so large it might be a rare occasion you actually have to empty it. Oddly, considering what comes with similar Black & Decker vacuums, this particular model doesn’t come with any, and Black & Decker’s accessories won’t fit it, either. This might be a function of this being on the cheap end of the company’s spectrum…but at least replacement filters are affordable. It’s true that this vacuum probably isn’t as strongly constructed as a more expensive handheld, but it does have its very simplicity going for it – there’s simply not enough moving parts or complicated components for it to break down much. 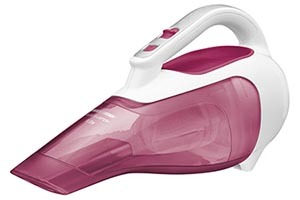 Surprisingly for both its size and cost, Black & Decker includes a two-year limited warranty with this Dustbuster. I was expecting maybe a one-year warranty, if that – so bravo, Black & Decker! This vacuum’s price is really its main advantage over similar handhelds – you’ll have trouble finding anything like it in terms of features and specifications in this very low end of the price spectrum. To put it succinctly, f you’re looking for a very affordable handheld that does a solid job, then this is the vacuum for you. Don’t be put off by its seeming lack of power – the CHV9610 quite easily handles the small messes that handhelds are made for, it’s lightweight and has a high capacity, and it’s even pretty to look at it.